What passing-bells for politicians who die as cattle? The allies did not sweep into Germany in 1918, winning the First World War with the glory and élan of a victorious army. The victors triumphed because they held their disintegrating forces together better than Germany and Austria-Hungary could manage. In the end, and in the case of Italy and France only just, and in the case of Russia not at all, they could just about bear the horrendous casualties and costs; the threat of mutiny at the front and of disease, starvation and revolution at home. 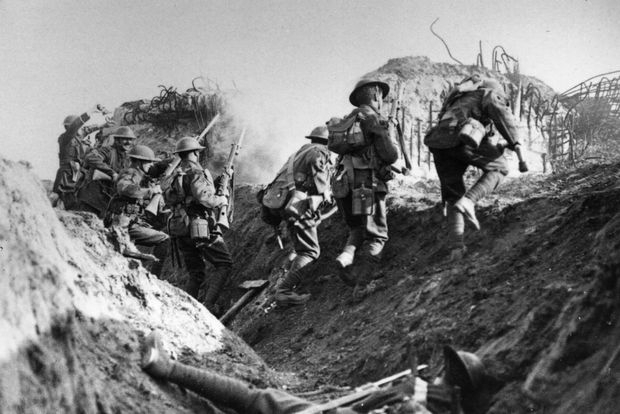 Labour and the Conservatives are like First World War armies. Neither will sweep the country. As much as fight each other, they fight to contain the casualties and desertions. The leader of the least battered force will stagger into Downing Street in May and celebrate a victory that will look like a defeat. Too much political commentary is empty speculation on who that maimed victor will be. You can make a good case that Labour will collapse first. It is being battered by the nationalism of the SNP in Scotland and of Ukip in northern England, just as the militarist nationalism of 1914 battered Europe’s social democrats. To add to Labour’s many woes, its leader “fails to convince,” to put it as politely as I can, as does his economic policy. Miliband thought he could escape his widespread unpopularity with his “35 per cent strategy”. But I doubt we will hear much more about it. Theoretically it sounded plausible – under first-past-the-post Labour could win a majority on a disgracefully small share of the vote, if its “core” and discontented Lib Dems turned out. The fallacy here is that the ‘core vote’ (if defined as anyone who says they will vote Labour) are motivated by the same political instincts as Labour activists. Rather, the voters who are in greatest danger of leaving Labour are, whatever their social grouping, those Labour voters who tell pollsters that they have doubts over whether Labour is the best party on key issues like the economy, taxation, unemployment, leadership and whether Labour is capable of delivering its promises. Labour looks a routed army until one stares across the trenches at the shambles of the Tories and the daily disgrace of David Cameron. Say what you will about Labour, but at least its MPs are not mutineers. Two Tory MPs have turned traitor, however, and the rest of the Tory right makes no effort to conceal its hatred of Cameron. I never understood right-wing complaints that “Cameron doesn’t believe in anything”. Now I must admit that they have a point. He has capitulated to his own right and Ukip – not that either is grateful – and condemns immigrants without even bothering to cover his back by saying that most are good people who don’t deserve to be left to drown. Cameron is abandoning the centre and looks as much a hopeless case as Miliband. As does the Conservatives core vote. It tells you all you need to know about the Tory Narnia most conservative politicians and intellectuals live in that it never occurred to them that a bankers’ recovery, which raised the salaries of the executives class while cutting the real wages of the working and middle classes would leave “natural” conservatives as unimpressed as everyone else. They are only now beginning to glimpse the consequences. I accept that either Miliband or Cameron will be prime minister – someone has to be prime minister, after all. But trying to work out who will be the first to surrender and shout ‘We can’t go on, we don’t want to go on, want to go home” is impossible and therefore futile. We can say with confidence how difficult the winner will find it to govern – and not only because he may well be in a coalition government and have a feeble mandate. Will Jennings and his colleagues at Southampton University have just released research on how respect for politicians has collapsed alongside respect for the main parties. The number of people seeing politicians as self-serving is at unprecedented levels. Some 48% think they are ‘out for themselves’, and a further 30% they are out for their party. A mere 10% believe they put the country’s best interests first. The fact that only 1 in 10 of us think politicians try to their best for the country represents a large drop, both from the wartime poll (where 36% were willing to see politicians as trying to do their best for the country) and from the 1970s poll (where 28% felt that politicians were out to do their best for us). Two consequences flow. First, Cameron’s demeaning efforts to appease Ukip voters are not only immoral but futile. Whatever he says, they won’t believe him. Far better to try to appeal to the rest of us, and and point out that no leader is as money grubbing or power crazed as Nigel Farage. Who will listen is another matter. The sea of public distrust that lies beyond Ukip’s know-nothings will make life next to impossible for the next government. It will have to tackle the huge problems of a failing economy, an ageing population and global warming. At every stage it will be met with scorn rather than support as vast numbers scream that their leaders are liars and frauds, and walk away. Whoever wins in May, their war will not be over. The swivel-eyed loons in the Conservative party are revolting. And they are right to revolt.